The Augusta Community Warming Center has closed for the season, but Bridging the Gap offers other help remains for those in need. AUGUSTA — The cold eventually goes away when the seasons change, but the need for help dealing with the complexities of life on the edge can be year-round. 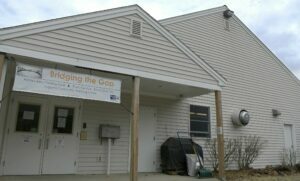 Bridging the Gap’s Augusta Community Warming Center recently closed following its first season in a new location on Eastern Avenue. But officials there said other services offered at the same site — help making connections with service providers in the area who can help people living in poverty, in need of food or a job, struggling with substance abuse or in need of other help — are still available there. And the nonprofit organization’s popular clothing bank, Addie’s Attic, and Everyday Basics Essentials Pantry, which regularly provides free toiletries and other items to those in need, remain open and busy. But some of its less visible services, such as the referral program, can help in ways just as essential, such as providing a child with a new pair of pants or hygiene products to people who otherwise might not be able to get them. “The resource connection piece is very important because things like poverty, mental illness, substance use disorder, food insecurity, these things don’t go away when it’s not winter,” said Santa Havener, co-director of Bridging the Gap. While the warming center doors are no longer open during the day, the referral services are available by calling Bridging the Gap at 530-0184 to make an appointment to meet with Havener. Neither Havener nor Sarah Miller, director of Bridging the Gap, are case managers. But they do know where to turn, primarily to other service providers or government programs in the area, where people in need can get help. For example, Havener said they may get someone in recovery from substance use disorder who needs help finding resources, someone who doesn’t have money to buy food or fuel who they could help find a local food bank or complete paperwork needed to get assistance, or who need help finding a job. Gayle Dinsmore, who worked and volunteers at the warming center, said she turned to Bridging the Gap for help when she was between jobs. She said they helped her find help paying for heating fuel, and with forming a business plan for her planned new venture, a business offering in-home personal caregiver assistance. 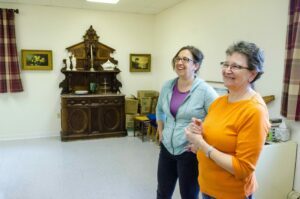 The warming center, an initiative led by the Emmanuel Lutheran Episcopal Church, saw attendance drop in its first season at 209 Eastern Ave., in the rear section of the church. This season, 184 different people went to the warming center, accounting for a total of 1,628 visits over the season. Most past winters have seen more than 200 different people go the warming center, when it was at the since-sold former St. Mark’s Parish Hall — a location more centrally-located in the urban area of the city. Miller said while the overall number of visitors to the warming center was down this season at the new location, they did get more homeless people there — about 45 people without permanent housing who were either living in their vehicle or outside, or living at the Bread of Life Shelter, which is closer to the new location than it was to the previous one. A Kennebec Valley Community Action Program bus also includes both Bread of Life and the Augusta Community Warming Center stops, helping people in need get from one site to the other. Miller said last year only four or five visitors came to the warming center from the homeless shelter on Hospital Street. Bridging the Gap has also recently added a third employee, Nicole Sciascia, to serve as operations and service manager, overseeing the pantries and other operations there. The position is a one-year role funded by a $20,000 grant from the Avangrid Foundation in partnership with Central Maine Power. Bridging the Gap is funded by its host church, donations, money received as a United Way partner, an endowment fund from the sale of St. Mark’s and fundraisers, including an upcoming e-waste recycling collection event from 9 a.m. to 3 p.m. May 4 in the north wing parking lot at the Augusta Civic Center at which people can make a donation in exchange for having their unwanted electronic devices recycled. Also continuing beyond the warming center season is the No One Left Behind Volunteer Program, in which volunteers, many of whom have also been users of the warming center, offer their time volunteering, including in the clothing and toiletries pantries on the site, which are open 10 a.m. to 2 p.m. Tuesdays and Thursdays, and 10 a.m. to noon the first and third Saturdays of each month. Since June 2018, 16 people have volunteered through the program, with eight currently taking part.